An eon ago, in a writing workshop, the then famous teacher whispered to this then whippersnapper the secret of writing books: Sitzfleisch. In other words, the ability to endure sitting in the chair for long periods of time. Well, some decades on, I may not have won the Nobel Prize (yet) but I am indeed talented at enduring daily marathons of sitting. This may be good for my writing (and all the podcasts), but dangerous for my health. My writing assistants haul me out for regular walks, and there's a bit o' yoga going on, but that is not enough. 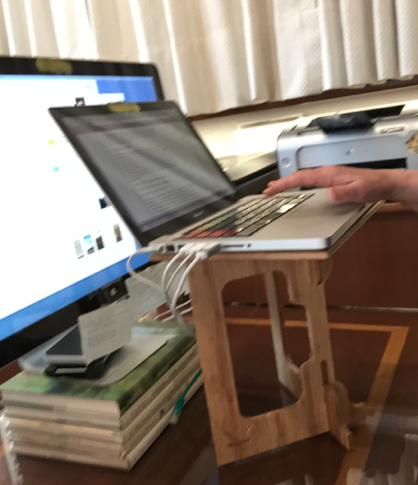 A standing desk to the rescue. 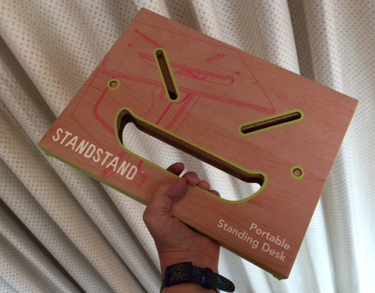 After some lickety-split googling on the subject, I settled on the StandStand. Finally, I have mine home in Mexico City and assembled. It's a superb product. It's made of bamboo and easy to assemble-- so it's light-weight, appealing to the touch, doesn't allow my laptop to overheat, and it's portable. 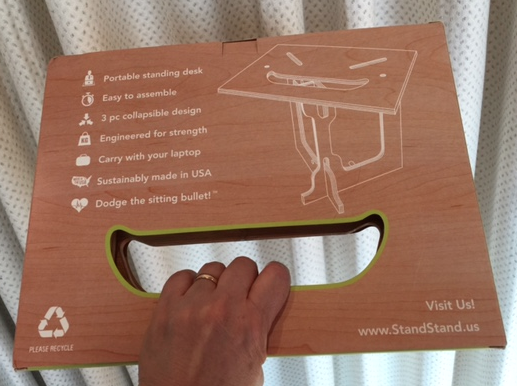 Oh, and it was inexpensive, especially in comparison with some of the mechanically operated standing desks. Looks like I may have Standfleisch, too. (Is that a word?) Onward! > Your comments are always welcome. 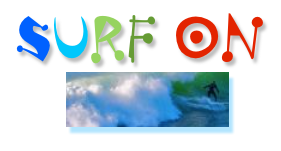 My newsletter goes out soon; I welcome you to sign up for it (automatic opt in and you can always opt out) here. "I really love this place out here, and I love the way it looks. I like the way it smells. I like to go outside at night and just look at the sky and feel the wind, and I think it's a really precious place, and I think it's a precious place because of what has come before and because of what's here now." Now available: the full transcript of Marfa Mondays Podcast #12 "This Precious Place: An Interview with Dallas Baxter, Founding Editor of Cenizo Journal"
More transcripts to be posted soon. Podcasts in-progress include interviews with Enrique Madrid and Lonn Taylor. >Your COMMENTS are always welcome. John Tutino: "We need Mexico as an other. We can't deal with it as an us." #13 “Looking at Mexico in New Ways: An Interview with John Tutino." John Tutino: "We need Mexico as an other. We can't deal with it as an us." But his whole point is that, in fact, US and Mexico are inseparable. It's a knock-your-huaraches-off interview. > Listen in to the podcast. C.M. Mayo: Welcome to Marfa Mondays. I’m your host, C.M. Mayo and this is Podcast 13 of a projected 24 podcasts exploring Marfa and the wider Big Bend region, apropos of my book-in-progress about Far West Texas. So far in the series I’ve interviewed people in and around Marfa and also reported on my visits to some very remote and intriguing places in the Big Bend, most recently, interviews with Dallas Baxter, founder of Cenizo Journal; and with luthier and cowboy poet singing some cowboy songs, Michael Stevens; and a visit to Swan House, Simone Swan’s adobe teaching house, inspired by the legacy of Egypt’s greatest architect, Hassan Fathy. I invite you to listen to these podcasts and all the others anytime at my website, cmmayo.com, and through the website, send in your comments. I’m always delighted to hear from listeners. Now in this podcast I take a big step back to get some perspective— big perspective. Bigger than Texas perspective. Those of you who know Far West Texas know how close Mexico is in every sense. Look at a map and you’ll see, from Marfa it’s only a little more than an hour’s drive to Presidio, which sits on the Rio Grande; cross over and there you are: Mexico. That’s what we’re going to hear about in this interview with John Tutino. John Tutino teaches the history of Mexico and the Americas in the History Department and School of Foreign Service at Georgetown University in Washington, D.C. He’s the author of Making a New World: Founding Capitalism in the Bajío and Spanish North America, which was published by Duke University Press in 2011. Tutino is also the editor of a collection of essays by various historians with the title Mexico and Mexicans in the Making of the United States, and that is available from University of Texas Press. This interview was recorded in his office at Georgetown University. C.M. Mayo: We have Making a New World and the related anthology Mexico and the Mexicans in the Making of the United States. These are closely related, and they are both nuclear bombs! C.M. Mayo: They’re huge paradigm-busting... across from the beginning when we had the expansion of New Spain in the 1500s to modern day immigration. My head is reeling with all this stuff that’s in these two books! And so I ended up writing Making a New World to just try to say, “New Spain, which is the root of Mexico, was absolutely an pivotal place to the origins of the modern world, modern capitalism, and equally absolutely pivotal to the origins of the United States.” And I was working on one when I figured out the other. C.M. Mayo: My sense is that in Anglo-American culture, we’ve always had this idea that, here is American history over here, and here is Mexican history over here, and yes, there was war and there was this and there was that, but you could like put a little bell jar on top of each subject, and what you're saying, and I know is true, is that, no, you have to look at them together. John Tutino: Yeah. I will tell you a story. I, years ago, put together a NEH [National Endowment for the Humanties] Summer Seminar for school teachers on the interrelated histories of Mexico and the United States. NEH, the grant proposal group, approved it. They wanted to fund it, but the staff at NEH refused my title, which was “Inseparable Histories: Mexico and the United States.” They said I could teach the seminar— this was in the early ‘90s— not having the primary title “Inseparable Histories,” and I tactically said, “Well, I want to do the seminar. I’ll negotiate the title.” But that’s the extent that this goes there. But I will also add that particularly the argument that New Spain was fundamental to the origins of modern capitalism and that it was, particularly in its north, one of the earliest, most dynamic capitalist places on Earth, is equally challenging a lot of Mexican scholars. John Tutino: They have sort of bought into a notion, they have been trained in a notion, that Mexico had its base in great Pre-hispanic societies that were destroyed by Spanish colonialism for three centuries, and then there has been a struggle to reconstitute something positive. And boy, there were destructions in early 16th century, though I argue they’re more disease driven than anything any human could impose. And yes, there have been struggles, but people have... I don’t fully understand, why not glory in the... You know, it’s a typical history, it’s a history of enormous economic dynamism and thus enormous conflict, change, human greatness, human exploitation, human difficulty, but it sort of puts New Spain and Mexico, I believe, at the absolute mainstream of modern history. C.M. Mayo: So, in other words is as you call “this enduring presumption” was that capitalism started with England. John Tutino: It has been the Anglo American gift to the world. C.M. Mayo: Would you say gift or plague? John Tutino: Well, either way. If you ask Anglo Americans, it’s their gift to the world. If you ask people who’ve experienced it without prosperity... And this is part of what I try to do. I think too often we argue that capitalism is easily the most positive thing the world has ever seen or it’s the most dastardly thing the world has ever seen, and I just see capitalism as a dominant historical reality with enormous creativities, positives, productive gains and, linked to it, changing rounds of difficulties, conflicts, human difficulties, exploitations, and we’ve got to quit arguing one against the other. We’ve got to figure out how to maximize one, minimize the other, but as a historian I just want to understand it. In terms of that I should emphasize, in terms of taking Anglocentrism away from the study of global capitalism, I have jumped on a bandwagon there. It really came out of Asianists. One part, Andre Gunder Frank who started writing on Latin America years ago, then went to China and wrote a book called ReOrient, and Kenneth Pomeranz, who wrote a book called The Great Divergence, and I will say Gunder Frank was more the cage-rattling ideologue and Pomeranz was more the careful historian. He’s currently, it took 10 years after the book, but he’s now president of the American Historical Association. But the two of them together right around the year 2000 said, in 1600 China was the dominant economy in the world, Western Europe was a minor player and they contended for three centuries, and before 1800 nothing made it certain that Europe was going to rise to dominance and Asia was going to fade. It was a historical give and take, and then some particular things happened around 1800 that shift this. They were debating this and they were all recognizing that silver was pivotal to this world economy. John Tutino: Was the place demanding...the silver that went to Europe ended up in China. C.M. Mayo: So this is the silver from Peru and from Mexico. John Tutino: Mexico. Scholars show for most of three centuries two-thirds of it passed east to Europe, but ended up passing through the Middle East, South Asia, and ends up in China. A third of it goes directly to Manila and ends up in China. John Tutino: Acapulco to Manila. And people always ask, “Why is Manila part of the Spanish empire?” It was a city of Chinese merchants under Spanish sovereignty who traded goods not just from China but from India, Indonesia, and sent them back. Have you ever been to what is now the Museo del Virreinato in Tepotzotlan on the road? C.M. Mayo: Yes, just north of Mexico City. John Tutino: North of Mexico City. There are two rooms there of Chinese-Christian-Asian art that were all brought back by the Jesuits because that was their colonial... It is the best way to see the wealth of China that was brought to New Spain by that silver, is to just go through those rooms in Tepotzotlan. C.M. Mayo: And this doesn’t fit with the image of Mexico in Anglo-American cultural history or our modern media at all. John Tutino: As a backward, exploited, crushed environment that Spanish colonialism just ground to nothing! And one of the ironies is... and we have a hard time thinking about it. So New Spain, I argue, was probably one of the three core regions of early modern capitalism, while Spain, its mother country, was in decline. And we’ve just got to learn to get over the presumption that Spain could be in decline as a European power but New Spain could be just flourishing. C.M. Mayo: What I loved about the opening of your book, Making a New World, was you start talking about...to illustrate your points, the individual biographies of several people in the very important city of Querétaro. And as a bit of digression I want to say, I’m an American and I’ve been living in Mexico all these years, and I come back and forth frequently, and it is very rare that anybody in the U.S. has even heard of Querétaro, and yet Querétaro plays a central role in the development of the Mexican economy from almost the very beginning. John Tutino: I will note it’s also coming back. It may be the single most dynamic place under the current NAFTA-driven economic revival. 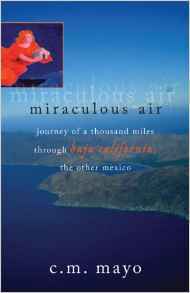 And Querétaro really became probably my favorite place in Mexico in the process of writing this book. I had been introduced to Mexico as a 17-year-old kid going to San Miguel de Allende and I’d lived for a full year in Mexico City, lots of time in other central Mexico places, most of all in Mexico City, but when I started doing this and started spending between two weeks to a month every year in Querétaro, and the mix of its colonial heritage and its modern dynamism just made it. It isn’t a museum like San Miguel. My apologies to the San Miguel tourist bureau. [Laughs] It’s a real dynamic city but with a wonderful historic arc. The argument is that this dynamism is there and that it is charging north. C.M. 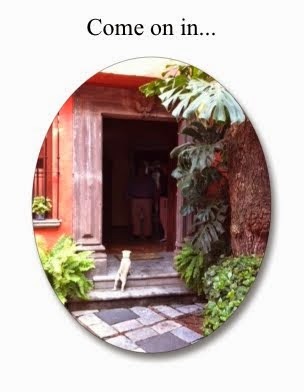 Mayo: Well, can we come back just for a minute to those individual biographies in and around Querétaro, part of the Bajío, which includes San Miguel de Allende. C.M. Mayo: It’s a group of cities north of Mexico City, kind of in the very heart of Mexico. John Tutino: It is absolutely the richest agricultural land in Mexico. Historically the richest mines in Mexico were in Guanajuato, and with the mix of those two, Querétaro was the richest trade and industrial city in Querétaro. C.M. Mayo: Oh, and Zacatecas. John Tutino: Zacatecas isn’t quite Bajío in Mexican parlance because it’s north, it’s dry, but the Bajío fed it because, precisely, Zacatecas is mining wealth in dry uplands. Where did Zacatecas get its food? So the Bajío is also in a sense sustaining places like Zacatecas. John Tutino: Yes, Colombini. And later in the book there’s huge excerpts from a poem he wrote in honor of Our Lady of Pueblito, the local Otomí virgin who historically and still in many ways centers popular devotions in Querétaro, the way Guadalupe has historically around Mexico City. Let me quickly go through my favorite vignette. The first one is Connín. Connín is an Otomí trader, frontiersman. He had traded across the frontier into the land of the Chichimecas. When Spaniards came he claimed to have been a lord; we don’t know if he really was but he was able to mobilize followers with a little bit of army, a little bit of settlement, and he, an Otomí trader or lord with somewhere between dozens and a few hundred Otomí friends, relatives, villagers recruited only a couple of Spanish Franciscan friars, and while literally Spaniards are still trying to conquer Mexico City, they go north and found Querétaro. And so Querétaro is actually an Otomí foundation with Catholic Franciscan sanction under Spanish rule. And for the first 30 years Querétaro is an Otomí city. Other than a priest or two there’s nobody else there. They build the irrigation. They build grist mills. They built the town. They distribute the land. And Connín and his pals take large landed estates for themselves, but they make sure their followers all have these incredibly rich irrigated gardens at the core of the city, and of course, he very quickly... he can’t remain Connín, he’s baptized and he becomes Don Fernando de Tapia. John Tutino: And you think he’s got to be a Spanish conquerer. C.M. Mayo: He’s got to be a Spanish conquerer and it turns out, no! He’s an Otomí trader who used to be called Connín! John Tutino: And it is the perfect example of how indigenous people weren’t always broken. They saw opportunity. > My newsletter goes out shortly. I invite you to sign up for it here. Slowly but surely, my many podcasts, including the Marfa Mondays Podcasting Project interviews, are getting transcribed. 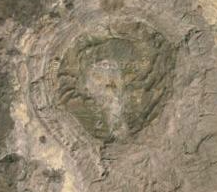 The latest transcription posted is one of my very favorite Marfa Mondays interviews, with Rock Art Foundation Executive Director Greg Williams, recorded last August 2014 at Meyers Spring ranch near Dryden, Texas-- just a scoonch west of the Pecos. C.M. Mayo: Welcome to Marfa Mondays Podcast number 15 of a projected 24 podcasts exploring Marfa, Texas and the greater Big Bend region of Far West Texas, apropos of my book-in-progress. I'm your host, C.M. Mayo, and on my webpage, cmmayo.com, you can listen in to all the podcasts anytime for free, and also there you can find out about my several other books. The most recent book is the reason these podcasts have been coming along a little more slowly this year. 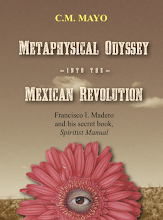 That book, which is done and now available in paperback and e-book formats, is Metaphysical Odyssey into the Mexican Revolution: Francisco I. Madero and His Secret Book, Spiritist Manual. 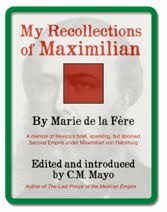 For those rusty on their Mexican history, Francisco Maderowas the leader of Mexico's 1910 Revolution and he was president of Mexico from 1911 to 1913, so his so-called secret book, which I translated into English, is in many ways quite illuminating. This podcast is of my interview with Greg Williams, executive director of the Rock Art Foundation. It was recorded on August 30, 2014 at Meyers Spring Ranch on the conclusion of a four hour tour of the rock art there and of the restored house of the military commander at Camp Meyers. Meyers Spring is one of a multitude of rock art sites in the Lower Pecos Canyonlands, a region around the confluence of the Pecos River and the Rio Grande and extending south into Mexican state of Coahuila— by the way, the native state of none other than Francisco Madero. In this region, to quote Harry J. Shafer in the introduction to his anthology, Painters in Prehistory: Archaeology and Art of the Lower Pecos Canyonlands, "Magnificent polychrome, pictographic images, panels, and murals exist that rival any in the world." Meyers Spring, which I toured with the Rock Art Foundation, is on private property a few miles drive from the tiny border town of Dryden, Texas. To quote from the Rock Art Foundation's website, rockart.org, "Meyers Spring is an isolated water hole in the arid lands west of the Pecos. Brilliant red paintings overlook a permanent pool of water sheltered only by a shallow overhang. Although faded remnants of much older pictographs can still be detected, the majority are attributable to Plains Indians who were latecomers to the region." 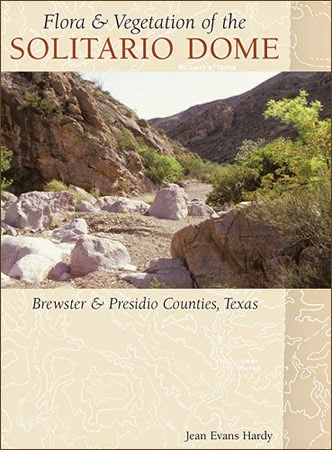 You can view pictures of Meyer Spring and other rock art sites on the website rockart.org, and for more about the rock art I can also recommend the books Painters in Prehistory, edited by Harry J. Shafer, and Rock Art of the Lower Pecos by Carolyn E. Boyd. Before we go to the interview with Greg Williams, executive director of the Rock Art Foundation, an apology for the sound. There's a bit of a roar which would be the very necessary air conditioner. This was recorded in the kitchen of the ranch house so people were coming in and out and there was some target shooting going on from the porch. I managed to edit out most of the shooting, but you'll still hear a few pops. I would like to dedicate this podcast to my friend and neighbor in Tepoztlán, Mexico, Patty Hogan, because Patty, I am so grateful to you for putting me in touch with the Rock Art Foundation. C.M. Mayo: Most people that I've talked to have never heard of rock art in this area, and yet there's a lot of it, and it's really important. Why is that? Greg Williams: Probably the best way I could explain it is explain to you what happened to me. In 1991 in my business I was trying to have some photography done, and so I looked in the phonebook and I saw a man named Jim Zintgraff who is a well-known San Antonio photographer. I hired Jim, and we went out to a photo shoot, and the conversation kind of waned, and my son and I had been camping in West Texas for years, and so the only thing I really knew about that I thought Jim might be interested in is I brought up West Texas, and it went from there. Jim was the director of the Rock Art Foundation then. Jim passed away eight years ago and I became director following him. But what happened is this gentleman brought me and my wife to West Texas to see things that I had never even known about, and they were the remnants of a past culture, a culture that had existed in the Lower Pecos region of West Texas, which is the confluence of the Pecos and the Rio Grande, for twelve thousand years. I had no idea that people lived out here for that long, And so we wandered around and we looked at the remnants of that culture. We looked at their lifeways, through the floors of these dry rock shelters, and we looked at their language, the stories that they wrote for us on the walls of these shelters, and we didn't know what they meant. You'd have to be in the mind of the artist to find that out, but you could sit and wonder about these folks who lived so long ago here and how hard the life must have been for them, in our context. For them it probably was not quite so difficult at all. They had plenty of food, plenty of water. > Your COMMENTS are always welcome. My newsletter goes out soon; I welcome you to sign up here. 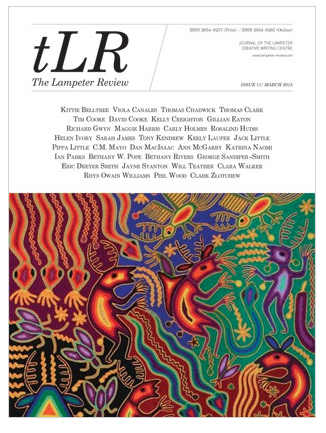 Just out, the new issue of the Lampeter Review on magic realism and Latin America, edited by Tony Kendrew, which includes a masterful short story by one of Mexico's greatest writers, Ignacio Solares, translated by Yours Truly, on page 22. > Read the complete issue on-line here. > And for the free PDF download, click here. Ignacio Solares' masterful short story "Victoriano's Deliriums," enters into the points of view (and what may or may not be some hallucinations) of the dying general and ex-President of Mexico, Victoriano Huerta. A little background: In 1913 General Victoriano Huerta led the coup d'etat that overthrew Mexican President Francisco I. Madero. A wealthy Coahuilan businessman and ardent Spiritist, Madero had led the 1910 Revolution, then campaigned for and won the presidential election in 1911. As President, Madero had trusted General Huerta, a fatal mistake. Huerta's own rule was troubled and brief. In 1914 he fled for Europe and then on arriving in El Paso, Texas he was arrested. Huerta died there in early 1916 from cirrhosis of the liver, while under house arrest. IGNACIO SOLARES is one of Mexico's best-known literary writers. 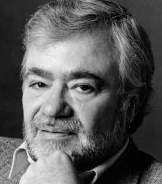 Among his many works are the novels Un sueño de Bernardo Reyes; Madero, el otro; El Jefe Máximo; and El sitio, which won the prestigious Xavier Villaurrutia Prize. Born in Ciudad Juárez, he now lives in Mexico City where he is editor-in-chief of La Revista de la Universidad, the magazine of the Mexico's National University. > Your COMMENTS are always welcome. I will be sending out my newsletter shortly; I welcome you to sign up for it here. Transcript of the Marfa Mondays Podcast #16: "Tremendous Forms: Paul V. Chaplo on Finding Composition in the Landscape"
Marfa Mondays 16: "Tremendous Forms: Paul V. Chaplo on Finding Composition in the Landscape" was posted as podcast (listen in anytime on podomatic or iTunes) back in January, but the transcript has just been posted here. 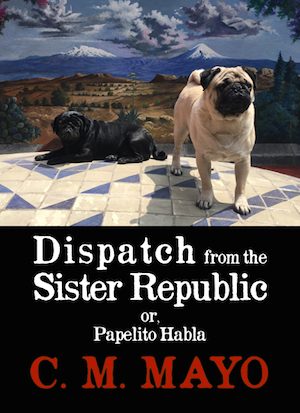 I'm aiming to post transcripts of all my podcast interviews, both the Marfa Mondays and Conversations with Other Writers (for the latter, so far, transcripts are available for Rose Mary Salum and Sergio Troncoso). Stay tuned for Marfa Mondays 17, an interview recorded in Fort Davis with Texas historian Lonn Taylor. P.S. If you want to just follow the Marfa Mondays Podcasting Project and related posts, check out my other blog, Marfa Mondays. I'm always encouraging fellow writers to join the Authors Guild for the legal services and the invaluable Model Trade Book Contract and Commentary (we're talking super crunchy boilerplate, much more than is available on the webpage, and whether you work with an agent or not, yes, you can keep your wits about you when they start talking about subrights clauses that sound like Masonic incantation). But it does cost more than the price of a hamburger dinner for seven to join, and I was just thinking, gosh, they really should offer a member directory with a little more oomph, when lo, that very invitation to fill out my new page arrived in the inbox! My one criticism of the Author's Guild is that it's oriented toward those with traditional publishers, yet these days, increasing numbers of even the most impressively published writers are becoming "hybrid," that is, going to ye olde publishers for some works, and self-publishing others as Kindles, PODs, and more. No doubt, I am one of many authors, whether current or prospective members of the Authors Guild, who would warmly welcome more information and support for the latter. That said-- so I hear from other members-- the Authors Guild author webpage services (check out Neal Gillen's and Sara Mansfield Taber's) and Backinprint.com program (see Sophy Burnham's The Art Crowd, for example) are very good. For my Far West Texas book-in-progress and the Marfa Mondays Podcasting project, I am working on an interview with Texas historian Lonn Taylor, plus a short piece about the Solitario Dome of Big Bend Ranch State Park in Far West Texas, which is to say, US-Mexico border country. by Charles E. Corry, et al. Geological Society of America Special Paper 250, 1990. 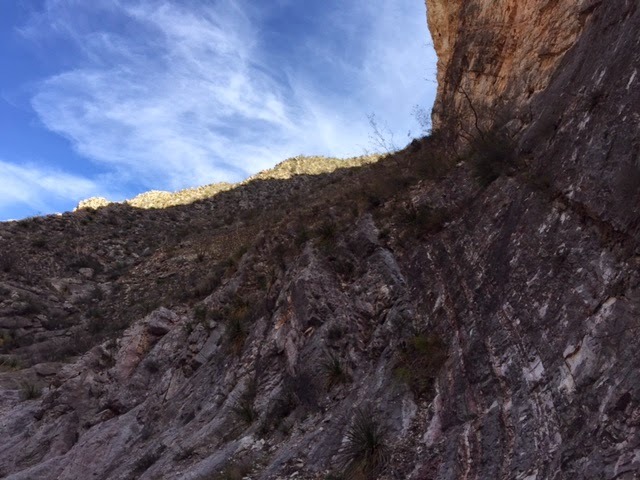 Implications for Calderas and Subjacent Plutons"
"The Solitario: Sentinel of the Big Bend Ranch State Park"
>Listen in to all the Marfa Mondays Podcasts anytime. 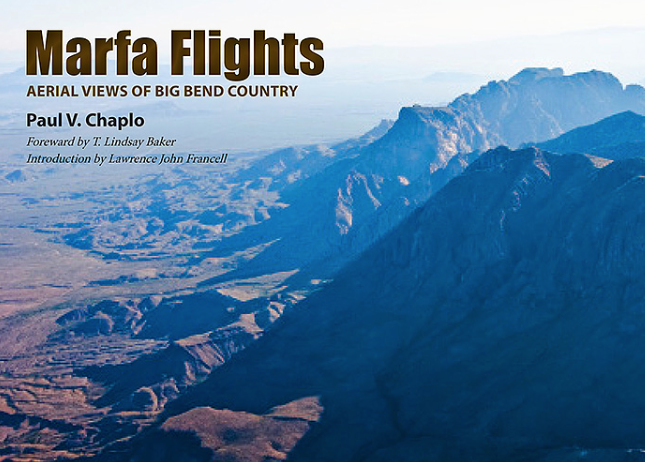 The most recent is "Tremendous Forms: Finding Composition in the Landscape," an interview with Paul V. Chaplo, author of the magnificent Marfa Flights. Back in 2012 for my Conversations with Other Writers occasional podcast series, I posted a fascinating interview with novelist and essayist Sergio Troncoso. You can still listen to that interview anytime on podomatic or iTunes, and the news is, I've just posted the complete transcript. There is also a transcript of my podcast interview with Rose Mary Salum. More podcasts and transcripts of same are in-progress-- coming soon, more Marfa Mondays. So what is Texas? One more mediation thereupon. 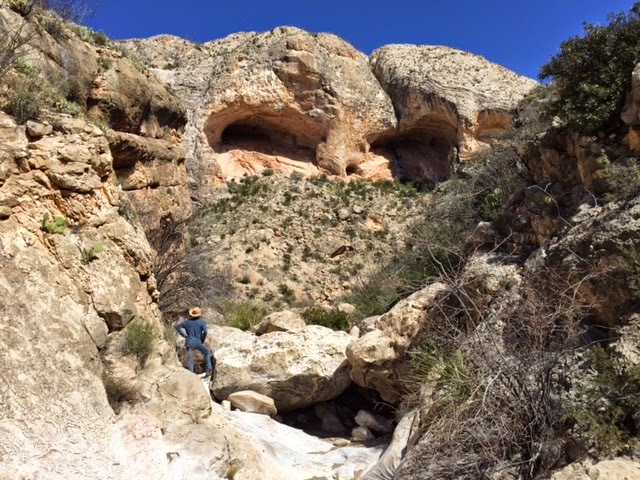 Field Lab blogger in Terlingua recites his poem, with pet longhorns. 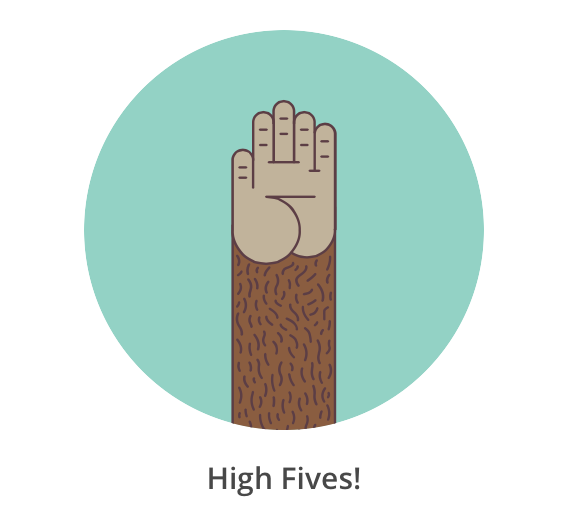 My February newsletter went out via the fabubananalous MailChimp.com a little while ago with podcasts, events, workshops, and much more. 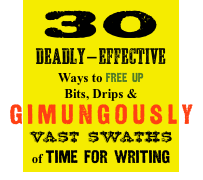 > Read the whole enchilada, plus all other enchiladas of yore, here. If you don't already, I welcome you to subscribe (it's free, automatic opt-in / opt-out anytime). Pita Amor recites her poetry. (If you don't speak Spanish, ni modo, this is a must-watch). P.S. My interview with her biographer, Michael K. Schuessler. I grew up in the San Francisco Bay Area and this is the first I've heard of the Bay Area Shellmounds (which, in itself, says volumes). "Anyone who claims to have useful information about the publishing industry is lying to you, because nobody knows what the hell is happening. My advice is for writers to reject the old models and take over the production of their own and each other's work as much as possible." From "Things I Can Say About MFA Writing Programs Now That I No Longer Teach in One" by Ryan Boudinot. P.S. Read my blog post on making PODs.